When the 20th Century dawned, Columbus was the world's capital in buggy manufacturing. One of every 6 buggies made in the world, were made in Columbus. Supporting these industries were a host of supporting industries. now stands and where the new Huntington Ball field is being built. However, with the invention and acceptance of horseless carriages made from steel instead of wood and leather, Columbus lost this leadership role in transportation to cities closer to the growing steel mills. 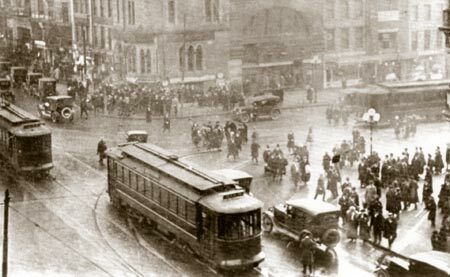 Broad and High Streets in 1913 looking at the southeast corner of the intersection. The electric trolley car made it possible for people to live further away from the downtown and still be able to work and shop in the downtown. The new century saw Columbus expanding in all directions. The electric street car made it possible for suburbs to spring up, where families could build homes away from the pollution the industrial city was producing. Marble Cliff, Grandview and Upper Arlington were developed to the northwest, up-wind of the city's pollution. 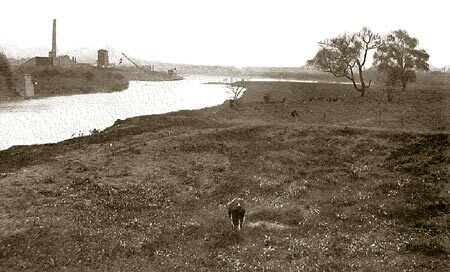 Above: Confluence of Olentangy and Scioto Rivers (circa 1908). The group of trees right center is about where the Confluence Restaurant now stands. In 1913, like many communities across Ohio, great floods destroyed not only properties along Ohio's many rivers, but also cost many lives. Eleven times in the last 100+ years the Scioto and Olentangy Rivers had flooded, but none of these floods compared to the great flood that came in March 1913. Over 5" of rain fell on frozen ground. The flood waters burst through the earthen flood walls built to keep the river back. Water was 26' deep in the area known as Franklinton; Columbus was shut down for 6 days and the west side of the river was shut down for over 6 weeks; and, most importantly, 90 people died in the flood waters. 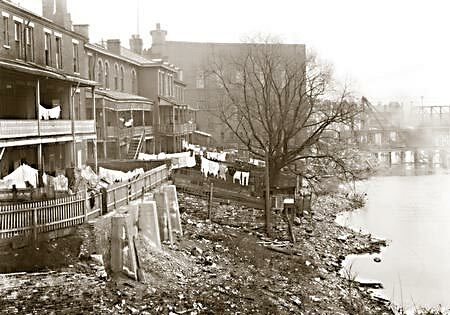 East side of the Scioto River just south of the Broad Street Bridge in 1910. From the flood of 1913, a plan began to take shape that would change the shape of downtown Columbus well into the 21st Century. 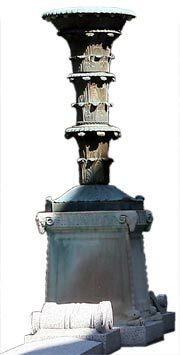 After the flood waters receded in 1913 and the dead were buried, the city began making plans so this devastation could not happen again and in so doing, led the way for making downtown Columbus a major metropolitan area. At the beginning of the 20th Century, downtown Columbus was a hodgepodge of factories and slums. After the flood city-wide changes started to take shape. The lighted arches built in 1880 were torn down. 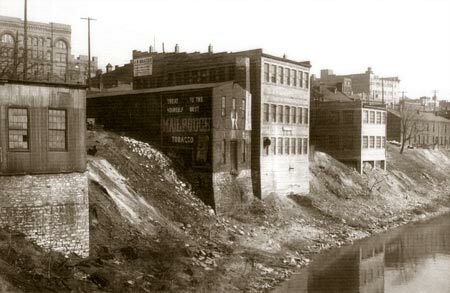 The empty factories, warehouses and slums along the river were also torn down. The Corps of Engineers came up with a plan that would hopefully protect the city from future floods. Massive flood walls were built on both sides of the river. In the midst of the Great Depression, government programs were created to put men to work on public works projects. 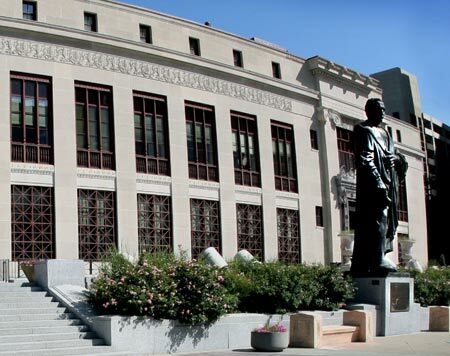 Those projects included the government buildings we still see today including City Hall, what is now the Ohio Supreme Court Building, Central High School (which is now part of the COSI building). Along with all this new development along the river, the American Insurance Union built Columbus' first skyscraper: the AIU Citadel (now called the LeVeque Tower). The concrete bridges across the Scioto (now being replaced) were also part of this new construction. 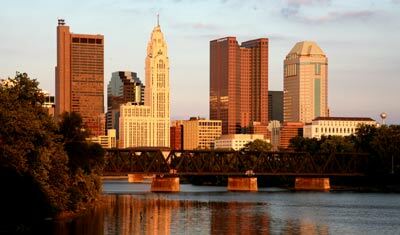 By 1950 Columbus had a population over 357,000. Most of the population lived outside of the downtown area in one of the numerous suburbs that had grown up over the last half century. But the city faced some daunting problems. In 1945 Mayor Rhodes formed what was called the Metropolitan Committee made up of 100 of the cities most influential citizens. This group study the most pressing issues of the day and made recommendations similar to what Mayor Coleman is doing today for driving Columbus well into the 21st Century. This committee helped develop plans for renovating the downtown area through demolition and new construction. While the city did get much needed new construction, it also lost part of his rich heritage. It is always cheaper in the short run to tear down, than to restore. the confluence of the Olentangy and Scioto Rivers. One of the reasons Columbus has grown in size over the last 40 years can be traced to the foresight of another mayor. Through the efforts of Mayor Sensenbrenner, the city adopted a policy that linked basic services such as sewer and water hookups by developers building outside the city limits to the condition that the new development be annexed by the city. So instead of the city becoming land-locked by new suburbs, those suburbs became part of the city in exchange for those basic services. These new developments not only added to the physical size of the city, but they also added to the tax base that made it possible to pay for necessary services such as police and fire protection.